K9A2 Neo-F Desktop Board is based on AMD 770 & SB600 chipsets for optimal system efficiency. Designed to fit the advanced AMD Phenom/Athlon/Sempron series in Socket AM2/ AM2+, the K9A2 Neo Series deliver a high performance and professional desktop platform solution. Other Thoughts: After two months, I love this motherboard more today than when I first got it. Mangled the I/O shield during installation, and called MSI. They had another one out to me--free!--in two days. As a former Asus owner, sheer joy over a web site that is actually accessible. Drivers updated recently from MSI web site downloads. Went off without a hitch. BIOS is feature packed but easy to navigate. Stable. Hasn't crashed on me once, after a lot of marathon gaming. Recognized all 4GB of RAM (2x2GB configuration) after a lot of fooling around in Vista, but that's a Windows issue, as much as anything. Can't believe how much value I'm getting out of this board. Looking forward to what it can do with quad-core upgrade. (Currently using dual-core.) PCI Express card is close to butting up against hard drive enclosure, but meh. RAM slots in odd position; not easy to reach once mobo is installed in case, but not deal breaker. Would buy again and recommend. Considering this for next AMD build. A++. Pros: Very good value, plenty of features for the price level. Good documentation in the manual. Cons: Very irritating onboard audio. As with another reviewer, the front USB1 connector does not seem to work with my case, although #2 does. Seems very prone to lockups from the slightest static on the connector panel. Other Thoughts: Definately worth the price, you get a solid board for a very good value. Cons: Only one SATA cable, had to buy another. Pros: sort of works good. all the features i needed. 125 watt processor supported. this is stated on the box and on the web site. mine is amd 6400. seamed fast for about a day. 2 stars because it is still technically running. Cons: well, it probably would have lasted a long time if it wasn't for bad shipping. i know how to ground myself when building a pc. i made no errors on my part. i wasn't druling on the board, or standing on a carpet while putting this thing together, and i say this because i believe many products are better than the rateing people give because they fry their boards. but in my case, the shipping was terrible. the problems: the bios can't hold any settings. i don't overclock. i just want the factory settings. it keeps trying to overclock itself? i get errors after random restarts saying the last overclock settings have failed. i havn't changed anything other than constantly going back into the bios to reset everything back to stock. their is no overheating. the psu is new and checks out. it was in the poorly packaged box too though. Other Thoughts: as i was saying, i bought 4 items, all came in one big box. lots of foam peanuts on the bottom of the box, none at the top. these parts are dellacate and need something to absorb shock. now i have to rma this board, and then re review, and rma my 640gig hdd. Pros: Just purchased this motherboard for a great price and got more than I bargained for. 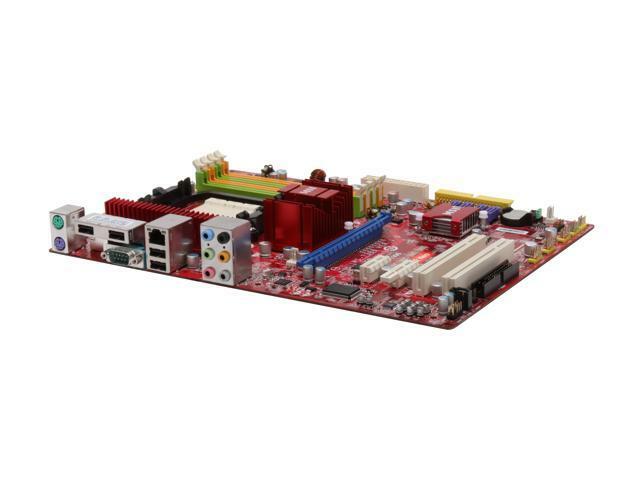 Typically I only buy Asus, but this motherboard may convince me that other brands are worthy. Other Thoughts: Was surprised that it did not come with any screws to screw the mobo down with. Fortunately my case had enough risers on it that I could remove a few to use as screws. Other Thoughts: Was looking for a bargain and a board that could accommodate today's budget AMD processor with a lot of room to grow down the road. This seemed to fit the bill, and I don't regret my purchase. This one purrs. I had issues in XP SP3 loading drivers from vendor Web site. Switched up to Vista and so far, seem to be having an easier go of it. USB from front of Rosewill case doesn't seem to like the USB1 connector on mobo. However, this could be a problem with case and not mobo. (Did not deduct any points for that one.) Onboard audio will have you tearing your hair out. Tried the drivers from Web site first then resigned myself to CD drivers. Even CD drivers caused a hiccup (Windows wouldn't recognize, blah blah.) Your mileage may vary. Pros: Would be good if it worked with ram speed I purchased because of this site.